Planning a Trip with Kids | UNIGLOBE Direct Travel Ltd.
Spring Break is a great time for family travel, but it can be hard to please everyone. Here's some tips for getting all the family involved and excited for your next family vacation. Ask for their ideas. Give your kids travel magazines and ask them to show you what kinds of images appeal to them. Allow your child to envision the perfect vacation. Let them get creative by drawing ideal travel scenes or describing a favorite travel memory in words or images. Use your child’s cues to plan a trip they’ll enjoy. Once you narrow it down to a few possible trip ideas, ask the kids to help make the final decision. I usually choose three destinations, tell my kids a bit about each one, and let them choose. 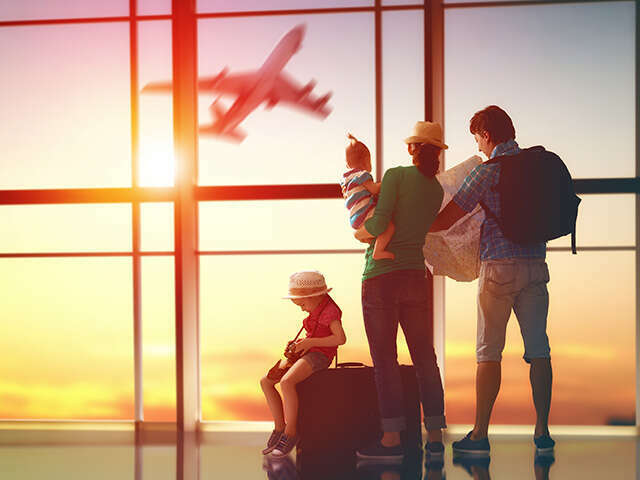 This process ensures that the destination is one the kids will enjoy, helps them look forward to the trip, and makes them more invested in the whole travel experience. Include one possible “highlight” experience for each destination to help them focus on what they could do there. Include photos from travel brochures or websites to help the kids envision the place. Family travel doesn’t have to be to a kid-focused theme park. Kids are naturally curious and love exploring with their parents, so it’s easy to plan a trip that the whole family will love. Seek out destinations with activities you can all enjoy every day. A destination that has something for adults as well is especially appealing. As an example, a vacation to California Gold Country, where an outdoor state historic park will interest the kids, hikes will keep everyone busy, and nearby wine tasting will be a treat for the adults. One of the most important aspects of young childhood is the growth of confidence, and travel is a wonderful way to encourage that in children. Travel is a time to explore limits and try new things, so seek out travel opportunities that will give your kids exciting new experiences. These may include developing new skills like helping to set up a tent, learning about local culture in fun ways, or even just testing their confidence while outdoors—crossing streams and climbing hills give big boosts to a child’s sense of self. Part of the wonder of travel is experiencing the new and unknown, but for kids, developing traditions and building on those memories year after year is also rewarding. For example, taking a vacation when school has just gotten out can be a reward for hard work that the child can look forward to every year. Consider travel traditions that can be easily repeated, yet evolve into something different each time as the child grows – perhaps an annual camping trip with the repeated traditions of hiking and roasting marshmallows over a campfire, or a larger trip like a family wildlife tour to a different part of the world each year. The predictability of an annual tradition makes trip planning easier. Travelling with children is more expensive than without, but it doesn’t have to break the bank. If flying as a family is out of reach, remember that plenty of adventures remain within driving distance. In a child’s view, the whole world is waiting for them to explore, so a well-planned getaway within driving distance may be just as fulfilling as a dream trip across the planet. With a mix of clever planning and getting the kids in on the process, we can create family trips that are fun for everyone.